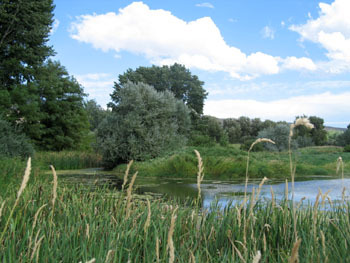 The Wenatchee Confluence State Park is at the confluence of the Wenatchee and Columbia Rivers, in the transition zone between the East Cascades and Columbia Plateau ecoregions. The park is continuous with Walla Walla Point Park on the south along the Columbia River. The best location for viewing a productive bay south of the confluence is a park bench and an opening along the north edge of Walla Walla Point Park, facing north. The 11-mile Wenatchee Loop Trail connects Confluence Park with Riverfront Park, offering excellent birding on the East Wenatchee side of the Columbia River at the Porter's Pond area. The 97-acre Horan Natural Area (HNA), south of the Wenatchee River, is the heart of this birding complex, comprising one of the largest remaining black cottonwood stands on the Columbia River. This area is especially important for migrating birds, due to its location in the bottom of the Wenatchee Valley and substantial riparian and wetland habitat. Several local and state rarities have been recorded here. Breeding habitat, although somewhat limited, supports several interesting species. Confirmed breeding species include: Wood Duck, Canada Goose, Mallard, Common Merganser, Osprey, Red-tailed Hawk, Ring-necked Pheasant, California Quail, Killdeer, Spotted Sandpiper, Wilson's Snipe, Mourning Dove, Downy Woodpecker, Western Wood-Pewee, Say's Phoebe, Western Kingbird, Eastern Kingbird, Tree Swallow, Cliff Swallow, Barn Swallow, Black-capped Chickadee, Gray Catbird, Yellow Warbler, Common Yellowthroat, Song Sparrow, Black-headed Grosbeak, Red-winged Blackbird, Bullock's Oriole, House Finch, and American Goldfinch. The Horan Natural Area is excellent for sparrows during migration and in winter. Species include: Lincoln's (often abundant in fall), Golden-crowned, White-crowned (common), White-throated (rare), Harris's (rare), Fox, American Tree, Vesper, and Savannah. Sparrows recorded only once or twice include: Baird's, Chipping, Brewer's, Clay-colored, and Lark, and also Lapland Longspur. Warbler numbers can reach extraordinary numbers, especially in late summer and early fall. Yellow-rumped (including fair numbers of Myrtle) and Orange-crowned Warblers are the most common, with Nashville, Townsend's, Wilson's, and MacGillivray's sometimes in fair numbers; Magnolia Warbler, Black-throated Gray Warbler, American Redstart, Northern Waterthrush, and Yellow-breasted Chat have also been recorded. Other passerines recorded here include Blue Jay, Purple Martin, Hermit Thrush, Veery, Rusty Blackbird, and Gray, Least, Dusky, Willow, and Olive-sided Flycatchers. Gulls, waterfowl, waders, and shorebirds occur along the river banks, especially in the large bay between Walla Walla Park and Horan Natural Area. Water levels fluctuate daily with limited shorebird habitat exposed at times. When water levels are high, check the mowed grass in the RV park and at Walla Walla Park for shorebirds. Nineteen species of gulls, terns, and allies have been recorded, including Parasitic and Pomarine Jaegers; Mew, Laughing, Little, and Sabine's Gulls; and Arctic Tern. Thirty-three species of waterfowl have been recorded including Red-breasted Merganser, Long-tailed Duck, White-winged and Surf Scoters, Eurasian Wigeon (regular), both swans, Brant, and Ross's Goose. Twenty-two species of shorebirds include both dowitchers, Whimbrel, Pectoral Sandpiper, and Dunlin. Other interesting species include Yellow-crowned Night-Heron, Red-throated Loon, Clark's Grebe, Green Heron, Cattle Egret, and American Bittern. Bald Eagles are regular in the winter, Black Swifts are occasionally observed in late summer (often during rain), and five species of falcons have been recorded, including Merlin (fairly common - two subspecies). A total of 224 species has been recorded in this relatively small area. Driving east on Highway 2, take the second Wenatchee exit, after which you will see signs to the Confluence State Park. Follow the brown signs to the park. Park just outside the main gate at the bottom of the hill, on the right. Walk along the main loop-trail to the south, across the blue foot-bridge over the Wenatchee River and into the Horan Natural Area Park. Checklists are available at a small kiosk near the restroom. Walla Walla Point Park is off Walla Walla Street, which runs parallel to and just east of Wenatchee Avenue. You can reach Walla Walla Street at 9th Street or Haney Street. There is a large camping area on the north side of the Wenatchee River.